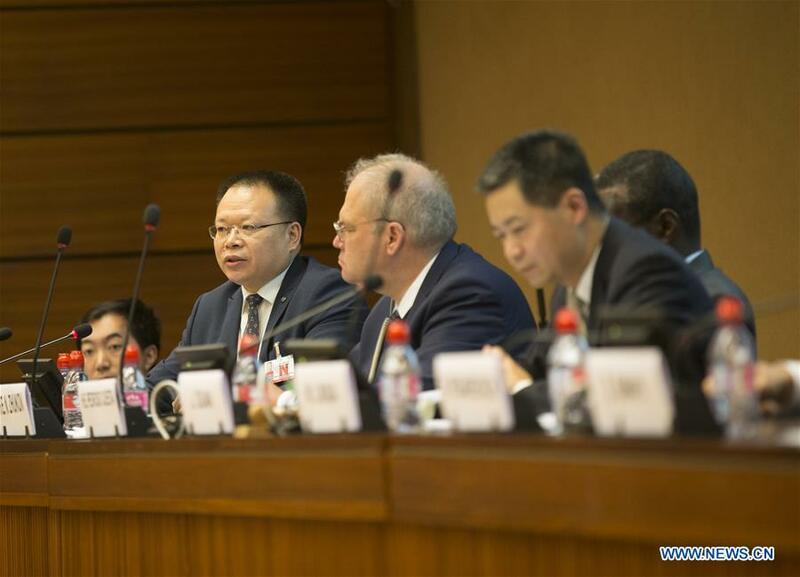 GENEVA, March 13 (Xinhua) -- Chinese delegates attending a UN side-event here on Wednesday introduced to foreign diplomats and delegates the progress in human rights promotion in China's Xinjiang Uygur Autonomous Region. Yu Jianhua, head of the China's Mission to the UNOG, said at the side-event that today's Xinjiang enjoys faster development and greater stability than ever before, and all ethnic groups in the region have full protection for their economic, political, social, cultural, and environmental rights. Yet for political purposes, some have spread rumors and told lies about what happens in Xinjiang in the hope of defaming China and the Chinese government. They are doomed to failure in the face of hard facts about Xinjiang's prosperity, development, stability, and unity, Yu said. Saying that the vocational education and training centers in Xinjiang are the right choice, the Chinese diplomat stressed that China will never allow terrorism and extremism to drag Xinjiang back or to take away what the people have earned for a happy life. As a Uygur scholar living and working in Xinjiang, Zuliyati Simayi, a professor from the School of Politics and Public Administration of Xinjiang University, said at the meeting that Xinjiang has been an inseparable part of China since ancient times and everyone there is just a member of the Chinese nation. The Uygur and other ethnic groups in Xinjiang have always been members of an intimate community, making Xinjiang a place of harmony among different religions and cultures, she said. Born and raised in Xinjiang, Zhang Nan, a researcher at the Anti-Terrorism Law School of the Northwest University of Political Science and Law, introduced the Chinese policy of religious freedom at the meeting, and by giving examples illustrated the serious threat and harm of terrorism and extremism. In this context, he said, it is fully necessary and justified for the Xinjiang government to take anti-terrorism and anti-extremist measures, including vocational education and training, to protect citizens' lives and property as well as their freedom of religious belief. Li Changlin, a professor at the Southwest University of Political Science and Law, who has visited Xinjiang many times, said at the meeting that through continuous improvement of relevant legislations, China has set up an effective anti-terrorism legal system. It is a basic principle upheld by China to fight terrorism according to law, protect human rights, forbid discrimination and address both the symptoms and root cause of terrorism, Li said. He also stressed that the vocational education and training measures in Xinjiang are implemented according to legal procedures and are effective measures to eradicate the hotbed that breeds terrorism and extremism. A number of foreign diplomats who recently visited Xinjiang, including Cuba's Permanent Representative to the UNOG Pedro Luis Pedroso Cuesta, Russian Deputy Permanent Representative to the UNOG Nikita Zhukov, and Belarusian Deputy Permanent Representative to the UNOG Vadim Pisarevich, also attended Wednesday's event. By introducing to the audience what they saw and heard in Xinjiang, they all mentioned their deep impression of the prosperity and stability there. Nearly 200 diplomats from over 70 countries, officials from international organizations and representatives from relevant non-governmental organizations were present at the side-event.